Since I usually pay for gas with my card at the pump, I don't often go in gas station convenience stores around town. However, they tend to be treasure troves of new and old candy, and an easy place to find regional items when travelling. These Starburst don't fall into the "new" category. I'm not sure if they are still in production, but they were purchased in a gas station, and there were only a couple of packages left. It was a risky move, but I went for it. Sour Green Apple was so sour that it prickled my throat. The apple flavor was very fake, but recognizable. Sweet Blue Raspberry had a nice sweet (albeit fake) raspberry taste with hints of the tart zing of the fruit, and it was probably my favorite. Sour Watermelon had an impressive sour punch, but I didn't think it tasted at all like watermelon. It's such a mild fruit that adding sour really makes it unrecognizable. Sweet Strawberry reminded me of ChupaChups suckers, with a fake but familiar strawberry flavor. 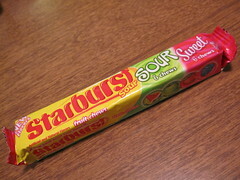 It did seem sweeter than the normal strawberry Starburst, and it wasn't as good. This variety was nothing special, although the sour ones were quite sour. 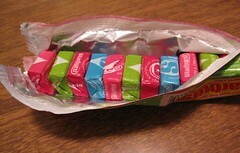 Maybe it's just bad execution, but this variety of Starburst didn't add anything to the brand. I'll stick with the original. Have a look at Candy Blog for another review.